How is Britain to remain a well-paid, successful and influential nation in the 21st century? However, the UK’s position as a world leader in the provision of international business services is under threat. The UK’s international financial services sector (i.e., “the City of London”) was by far the most dynamic part of the UK economy from the 1960s to 2008. The City remains massively important to London’s prosperity and indeed to the economic well-being of the UK as a whole. 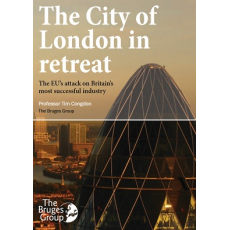 Unhappily, the City of London is now in retreat, with excessive and unfriendly EU regulation being largely to blame.